For lunch last Sunday, we made our favorites, Thai Tofu Burritos, but this time we improved them by adding some homegrown sweet potatoes to the filling. I've included the revised recipe below, along with our recipe for purple cabbage slaw, which is what we always serve as a side with our burritos. Sunday's meal was particularly delicious because we ate it at the picnic table by the pond in the most perfect weather. There were ruffly white oak leaves overhead and ferns all around our feet. Babs was strolling about the yard, and she came and stretched out on the stone path that runs next to the picnic table. "She just likes to be nearby," Rob said. Then she went and climbed into the compost bin. "I think she's hunting a lizard," Rob commented. But thankfully it got away. Maggie is so tough; she catches squirrels and rabbits. But Babs is a small and gentle creature; she only catches butterflies. Prepare the peanut sauce and set aside. Here’s how to do it: In a bowl, mix the peanut butter, coconut milk, hot peppers, water, lime juice, soy sauce, hot sauce, ginger, and garlic. Make sure the sauce is smooth and that there are no peanut butter lumps. Mix in the cilantro just before serving. Cut the tofu triangles in half, or in thirds if you prefer. Set aside. Sauté the ginger, cayenne peppers, garlic, and soy sauce in a little oil. Add the sweet potatoes, cover, and sweat until the sweet potatoes are tender. Add the red bell pepper and onions and sauté until the onions are soft and translucent. Be careful not to let the garlic burn. Add the tofu and the peanut sauce and cook until heated through. Before you add the sauce to the pot, be sure to reserve enough to drizzle over the top of your burrito. Heat your tortillas. 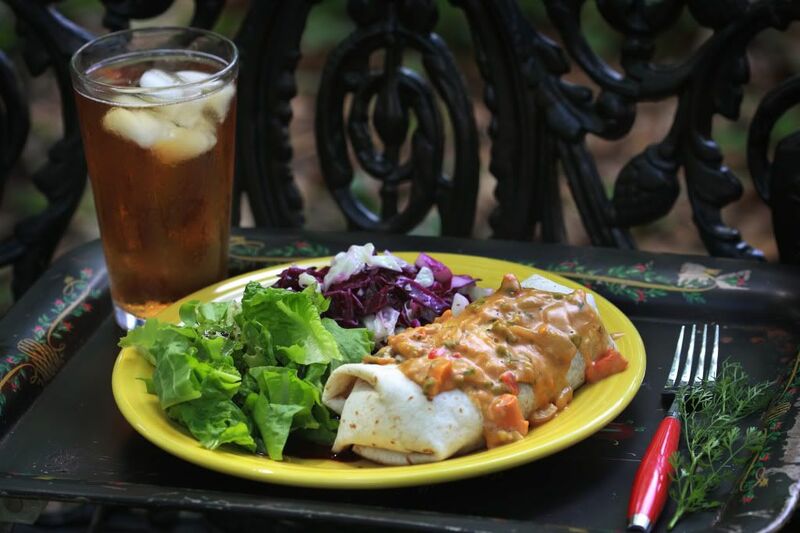 Fill each tortilla with a little rice and plenty of tofu-bell pepper-peanut sauce mixture. Roll up the tortilla. Drizzle Thai peanut sauce over the top and then sprinkle some fresh cilantro on top of the sauce. Make the dressing by whisking together vinegar, sugar, oil, and salt. Shred the cabbage and put it in a large bowl. Pour the dressing over the cabbage and toss well to mix. Chill before serving. Oh, it's a really good recipe. You'll love it. And the pre-fried tofu is so delicious--very chewy and satisfying!